The MiniSpir with graphs from WinSpiroPRO in the background. the industry is seeing many medical devices becoming more focused on, or even dependant on, the use of a computer. The latest spirometer from MIR (www.spirometry.com) is no exception. 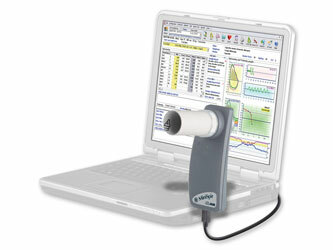 The spirometer simply consists of a digital laser pick-up in hand held device for holding turbines and tubes that connects to a computer via USB. And thats where it gets interesting. MIR has spent years developing software that not only records all normal spirometry tests (FVC, FEV, VC, MMV, IVC, PRE-POST BD, etc etc) in real time, but it presents them in crystal clear hi-definition colour so PRE/POST and individual tests can easily be differentiated and compared. Just one click can then select and send your spirometry results and graphs via email! Curves and tests can be exported in various popular formats including Word, Excel, Adobe Acrobat, HTML and text files. New and intuitive hyperlinked spirometry curves. Bronchial challenge and bronchial dilator protocols, with one click operation. With a computer and the WinSpiroPRO software taking care of the analysis and data recording, MIR has focused on getting the simplest, smallest and most accurate handsets available. They have come up with the MiniSpir. The MiniSpir weighs just 60 grams, so it is lightweight and comfortable to hold. It plugs in to a computer via USB and requires no further power. Despite its small size and weight, it contains a highly accurate laser pick-up for monitoring flow. MIR has also developed a world first in disposable turbines. For ~$2/turbine you can carry out spirometry tests with absolutely no chance of cross-contamination (you can still use a reusable turbine if you wish). The MiniSpir marries the accessibility and power of modern computing seamlessly with a spirometer to give you the lightest, most accurate, most powerful spirometry option yet. To read more on what MIR is doing in spirometry, go to www.spirometry.com. To see a range of MIR spirometers (including the MiniSpir) from Economedical that you can buy today, click here!